Oolong is one of the most popular of traditional Chinese teas. 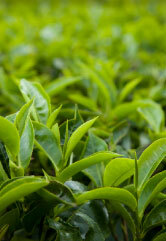 All green, white, oolong and black teas are made from the same tea plant, Camellia sinensis. Oolong is semi-oxidized, and falls between minimally oxidized green tea and more highly oxidized black tea. 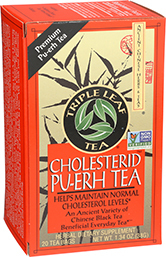 Oolong teas are called gingcha in Chinese, which translates as clear tea. 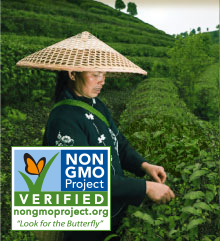 Wulong oolong tea was first discovered during the Ming Dynasty. 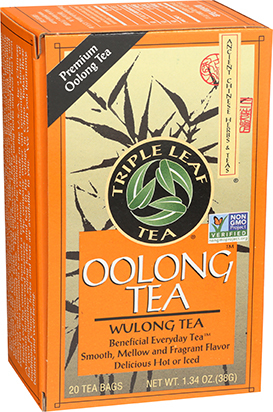 It is thought that oolong tea was named after the Wuyi Mountains in the Fujian province of China. 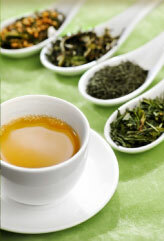 Oolong teas are now grown in China, Taiwan and other tea producing countries. The partial oxidation processing methods produce oolong teas of special complexity and roasted flavor without bitterness. Our tea is a high quality oolong tea, with a smooth, mellow and fragrant flavor and a warm golden color. This delicious tea is good to drink hot or iced. Experts recommend drinking three or more cups of tea a day. For additional support, drink any of Triple Leaf Tea’s Green, Jasmine Green, Decaf Green, White, or Cholesterid–Pu-erh Teas.